Although you may not always consider your gutters, they play a vital role in the general state of your home. Poorly maintained gutters or gutters which have sustained serious damage may result in additional harm to other sections of your house, so ensuring they are in good shape is essential. In this week’s article, we are going to provide you with some basic suggestions about how to best clean and manage your gutters. When it comes to keeping your gutters in good shape, among the biggest issues is that of congestion. Events that cause strong windows or seasonal changes may cause trees to lose a significant amount of their leaves, which then find their way into your gutters. To prevent leaves, twigs and other debris from getting into your gutters, it’s worth considering installing gutter guards. Gutter guards are typically a plastic mesh that fits into your gutter and prevents any form of debris that is often responsible for clogging up your gutters from collecting. Of course, before you put in gutter guards, be sure that you have eliminated any present debris out of the gutters. Eliminate debris. 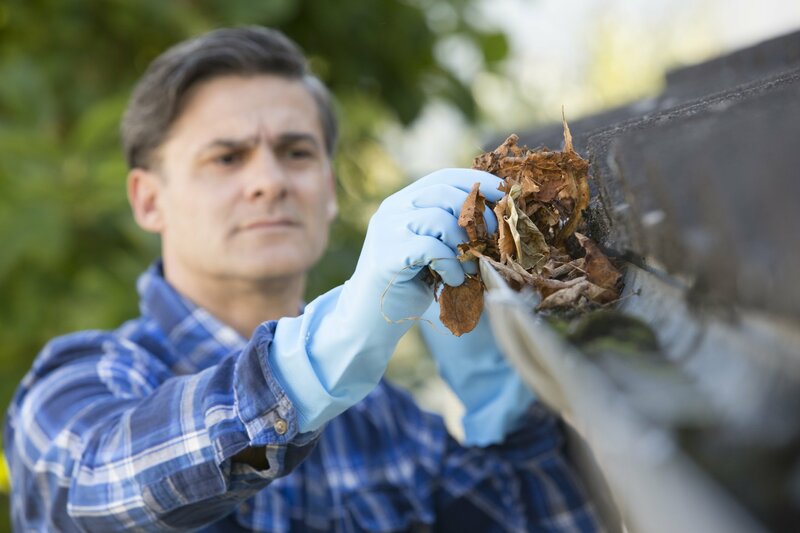 Check every section of your gutters for debris and clear all of it, one area at a time. Take note that having a hose and forcing the debris down into your downpipe is something that you should NOT do since this will just cause clogging issues instead. At the same time, when eliminating the debris by hand, make sure you are pushing the debris away from the entrance of your downpipe. Check for leaks and rust. A few more things to do before getting gutter guards would be to hunt for any leaks and rust. If you merely have pinhole leaks, these can normally be fixed with some roof sealant. If the leaks are more serious, however, the ideal approach is to hire a professional. Gutter corrosion is not as big of an issue as it was due to most gutters being made of hard plastic but, if you still possess a metal gutter, rust is a possible issue. Pooling water or excessive moisture may result in rust. If you spot any, call a professional to repair or replace those components. After the debris has been removed and your gutters repaired as necessary, you should be good to go to install those gutter guards, which will make future maintenance a much effortless task. Take note that if you choose not to install gutter guards, it is crucial to examine your gutters every few months to check and make sure that any clog-causing debris has not made its way in there. Lastly, remember to always keep an eye on your gutter straps. Be sure to re-nail or tighten them if any of them have loosened. If any of these straps have been seriously damaged or ruined, a replacement is needed as soon as possible. You’ve got this! Regular gutter maintenance will keep improving the overall health of your roof and house.